Earlier this year, I wrote an article on how to use LinkedIn’s advanced search operators as search agents in which I briefly mentioned and demonstrated an undocumented LinkedIn search operator at the very end of the post. If not, you’re in luck. Although it’s not an Earth-shattering discovery by any means, it is a discovery nonetheless, and because I keep encountering people who don’t know about this LinkedIn search operator, I thought it would be a good idea to dedicate a short post to the topic to ensure ensure everyone is aware of it. 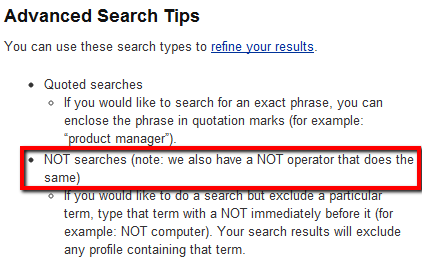 If you take a look at LinkedIn’s Advanced Search tips or in LinkedIn’s Help section, you will see the standard Boolean operator explanations. Okay, maybe that’s not so mysterious, but at least it could be interpreted a number of ways. In any event, I haven’t found any LinkedIn documentation that actually specifies their NOT operator other than “NOT.” If you find some, please let me know. One day I was curious to see if I could use the minus sign inside LinkedIn, and lo and behold, it worked. I’ve found that you don’t actually have to use the NOT operator when searching LinkedIn – neither in the Advanced Search interface nor in the Quick Search bar. That’s because LinkedIn supports the minus sign (-) as the Boolean NOT operator, just as Google does. This works for single search terms, quoted phrases, parenthetical OR statments, LinkedIn’s advanced operators, and it also works in every search field I’ve tested – Keywords, Title, Company, etc. As I was working on this post, I spent a little time looking for some kind of reference to LinkedIn supporting the minus sign, and before I got bored of finding nothing, I did discover this little gem in LinkedIn Answers from back in 2007. I found it interesting that the suggestion to try the minus sign was proffered by non-recruiters/sourcers (one was a UNIX admin). It’s not really a big deal, but I like discovering things, and I also like sharing what I discover. I also have to say that finding 1 undocumented search operator makes me wonder if there are more. Have you found any? 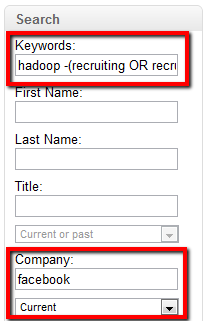 As someone who gets annoyed that he has to capitalize Boolean operators on Internet search engines and LinkedIn (I don’t have to in my ATS, nor on any major job board resume database), I’m quite happy that I don’t have to type AND, nor do I have to type out NOT when searching LinkedIn. I’m a fan of efficient and concise query syntax, so I owe LinkedIn thanks for supporting the minus sign as the NOT operator. I’d also suggest that LinkedIn include this in their documentation so other people don’t have to learn about it from my site or stumble into it out of curiosity like I did. While being able to use the minus sign as the NOT operator in your LinkedIn searches isn’t a huge deal, the NOT operator/functionality itself IS a big deal. In fact, I believe the NOT operator is the most powerful and least utilized of the 3 main Boolean search operators.